When it comes to buying a projector, most of us only know that we need one. The rest, as they say, is a mystery. From projection resolutions, lumen counts and contrast ratios to aspect ratios and more, knowing which projector is right for your business or school can be difficult. We’re one of the UK’s leading supplier of data projectors to both schools and educational establishments, and over the years we’ve gotten quite adept at knowing that our customers need to get the most out of their projectors. With that in mind, we’ve put together this guide of general requirements for business, education and mixed users looking to buy a data projector. Let’s get started. Buying a projector for use in educational environments isn’t about buying the cheapest possible, it’s about picking the right specifications. Chief amongst those is the requirement for a projector which can display a 4:3 aspect ratio. This almost square format is favoured in educational environments ahead of 16:9 because it’s easier to read documents and web pages. You’ll also find that the majority of interactive whiteboards and portable projection surfaces are designed for a 4:3 aspect ratio. Models like the BenQ MX570 outputs in a native 4:3 aspect ratio, whilst others can output in a number of aspect ratios, making them a more versatile choice. Other things to consider are contrast ratios and lumen count, which indicate how visible your projections will be in well-lit rooms. Business users typically lean heavier on multimedia presentations, like the running of video and sharing presentations. As such, a 16:9 aspect ratio, like that of the Casio XJ-A147-UJ might well be an important consideration for a business projector. Projection resolution is also likely to be a more important consideration. Not only do higher resolutions make reading documents and presentations easier, they’re also essential for displaying graphic design and video editing work at their best. 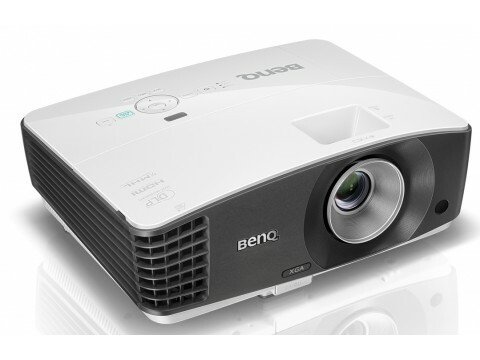 High end projectors like the NEC P502HL fit the bill perfectly, and are terrific for displaying graphic design work. Finally, it’s worth considering whether your business could benefit from a projector with built in speakers. For business use, the smaller and less powerful speakers of a projector are typically all that you require. For mixed users, who whose requirements span both business and education use, we’d recommend a projector which can handle multiple use cases with ease. The Hitachi LP-WU3500 is perfect for heavy usage, with a 20,000 light source life, 1080p resolution, strong 30,000:1 contrast ratio and boasts a high performance 1.7 zoom lens for adapting to different room sizes and demands.